Do you know? Baiyoke Sky Hotel Bangkok is one of few hotels located very near to the Airport Rail Link station, offering our hotel guests an extra option to travel from/to the airport without worrying about how bad the traffic is. As Baiyoke Sky Hotel Bangkok is located very close to the Airport rail link "Ratchaprarop" station. 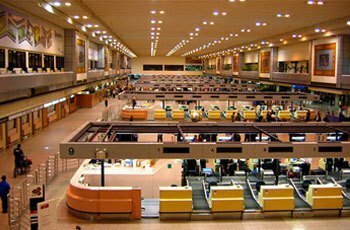 So after you exit the custom gate, go to the airport rail link station, located on the basement level of the Suvarnabhumi Airport. Baiyoke Hotel guests are highly recommended to purchase a City Link Train ticket instead of a Direct Express Train. For passengers travelling to or from Bangkok’s Don Muang airport there are a number of transport options available. The most convenient choice for many passengers will be taking a metered taxi in air-conditioned comfort. There is also the option of taking the train between Don Muang railway station and Hualamphong station from where passengers can transit to the MRT (metro service). However, trains aren’t that frequent and are often delayed. 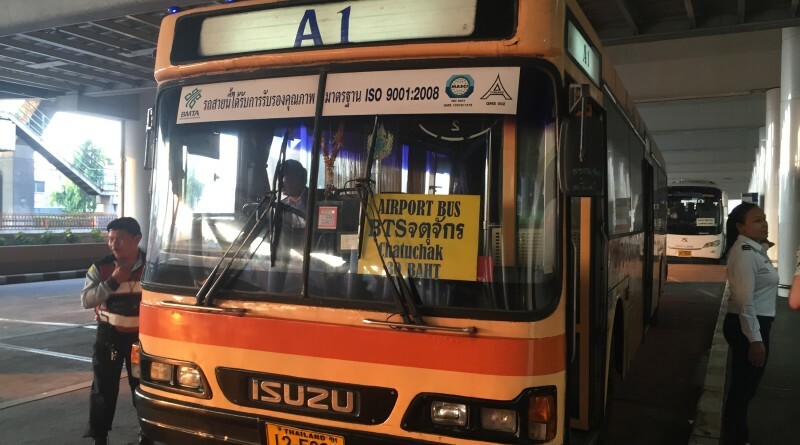 Another option for travellers going to or from Bangkok’s Don Muang airport is the efficient and easy to use bus service which connects up with the BTS (Skytrain service) and MRT. When you enter arrivals at Don Muang airport head for Door 6 to catch the airport bus into Bangkok. When you go outside Door 6 you’ll see a waiting area and a sign saying ‘BMTA Bus’. There are actually 2 routes; A1 and A2. The price on both routes is 30 Baht per passenger regardless of where you are getting off. You pay the money directly to the bus conductor on board. Try to have either the exact fare or small denomination notes. The buses are orange-coloured and clearly marked on the front A1 or A2. The buses used are old, but they are air-conditioned and I’ve always found the service efficient whenever I’ve used it. 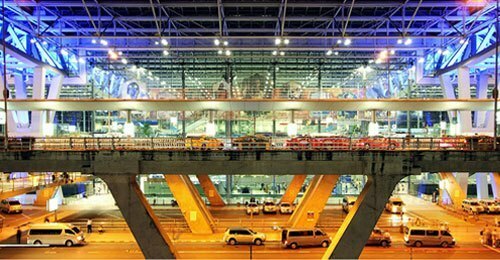 There is also a free shuttle bus service that goes to Bangkok Suvarnabhumi airport. The shuttle bus to Suvarnabhumi airport departs from outside Door 5 at Don Muang. Lat Phrao Central Festival. Journey time 15 minutes from Don Muang. Chatuchak drop-off point for BTS and MRT. Journey time 20 minutes from Don Muang. The bus drops passengers close to the MRT metro station of Chatuchak Park. Less than a minute walk further on brings you to the BTS Skytrain station of Mo Chit. The final stop is for Mo Chit Northern Bus Terminal (also known as Chatuchak Bus Station). Journey time 30 minutes from Don Muang. I’ve also noticed a few times using this service that the bus conductors will often make an additional stop just after Lat Phrao if there are any travellers heading to Khao San Road. The conductors usually speak English quite well, are very helpful and will tell backpackers what bus number they need to change to reach Khao San Road. Lat Phrao Central Festival (15 minutes from Don Muang). Chatuchak for BTS and MRT (20 minutes from Don Muang). Victory Monument is the final stop (journey time approximately 60 minutes from Don Muang, but depends on traffic). The A2 service is also listed here as stopping at Saphan Kwai, Ari and Sanam Pao before reaching Victory Monument. From Victory Monument it’s possible to catch a mini-van to various destinations in Bangkok as well as those further afield including Ayutthaya, Hua Hin and Pattaya. Please note though, space in these mini-vans is limited so if you have large bags you will probably have to pay for 2 seats. The drivers that operate out of Victory Monument also have a dubious reputation for driving too fast. The A1 bus also runs a frequent service back to Don Muang airport. If you take the BTS Skytrain to Mo Chit you need to use Exit 3. From there you walk across a covered bridge over the main road and if you look down to your right you’ll see a sign for the A1 bus stop. If you are travelling by the MRT metro, go to Chatuchak Park and use Exit 2 and you’ll see the bus stop just in front of you on the main road. Buses run every 12 minutes (7am to midnight) to Don Muang with a price of 30 Baht. The A1 service starts from Mo Chit bus station so you may see a few passengers already on board if you are getting on from Mo Chit BTS or Chatuchak Park MRT. The A2 bus service also departs to Don Muang every 30 minutes from Victory Monument. The A1 and A2 airport buses are air-conditioned. There is some luggage space inside the airport buses to the front and rear, but not as much as you’d maybe expect. Buses can get busy from Don Muang, but with such a frequent service you can simply wait for the next bus if the first one is already crowded when you try to get on. If you are connecting to the BTS or MRT, trains can get crowded at any time of the day and especially during the morning and evening rush hours. Be prepared to open your bags if asked to do so by security officers when entering the BTS or MRT network. The bus and Skytrain/metro combination can be a good option for solo travellers, those travelling light or those on a budget, but won’t be suitable for everyone. If you are travelling with children, there are more than two of you or your bags are big and heavy, I’d suggest taking a taxi straight to your destination in Bangkok from Don Muang airport. You also need to keep in mind that if your accommodation isn’t close to a MRT metro or BTS Skytrain station you’re probably going to be taking a taxi anyway for part of the journey.